Dennis Marron wanted a new surfboard, so at age 15, he took his first job in a restaurant washing dishes to pay for it. In the years since, the New Jersey native graduated from the Culinary Institute of America, headed West to cook in San Francisco and Minneapolis, and returned to the East Coast where he landed in the kitchen at Bistro Bis. 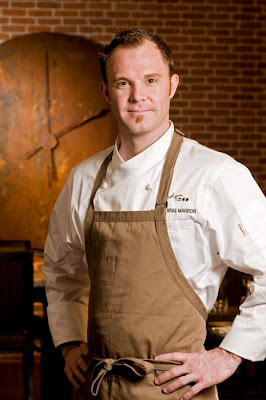 Kimpton Hotels tapped him as executive chef of The Grille at Morrison House, and earlier this year he also took over the kitchen at the Hotel Monaco's Jackson 20. 1. Bologna, egg and cheese from the Blue and White. "And the fried chicken leg sandwich (bone in of course). All the food is super cheap and delicious — just get there before 11 a.m. if you want breakfast and try the coffee with cream and sugar, super sweet but one of a kind delicious." Blue & White is a great carryout. Scrapple and eggwich, and the fried chicken livers are amazing. A short walk from Braddock Road Metro and well worth it.